During a discussion about the merits of the death penalty on ABC’s This Week with George Stephanopoulos, conservative commentator Laura Ingraham had some strong words about the “culture of death” in America surrounding abortion in this country. I think in 2013, there were about 3,000 people on death row. Only, I think, 2% of those are -- were executed. A small number. 39 people. I'm troubled by the fact that there are people that have been exonerated through DNA. That's horrific. And we have to do something about that. The idea that it's cruel and unusual, the court handled it in 1977. That’s not going to change. But I do think these images will have some perhaps political impact in the anti-death penalty crowd. Of which, President Obama is not, by the way. They’re going to seize on this. The conservative commentator concluded by doubling-down on the need to protect innocent life. I think we do have a problem in our culture, our broader culture, of being a culture of death to some extent. We saw that with the Gosnell case. Late-term abortions. The heinous things happening in the womb to children. You don't want to equate it but innocence. There could be innocent people probably today on death row. There’s a lot of innocent life. Forget the early term abortion, late-term abortion that I think young people as well are changing their mind about the issue of abortion. 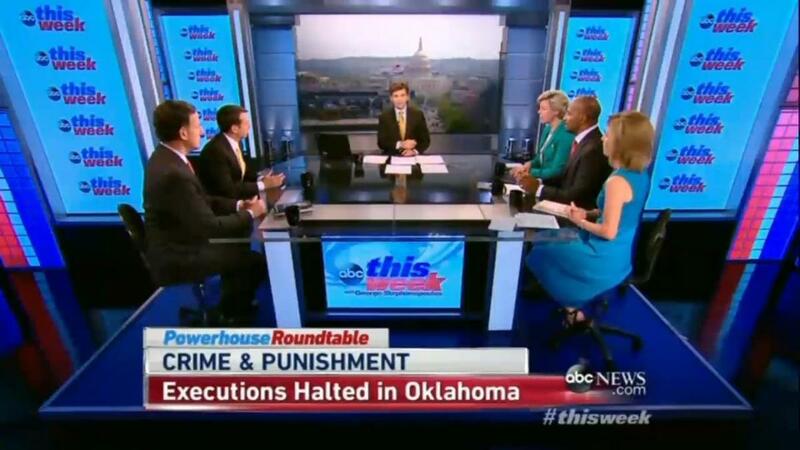 GEORGE STEPHANOPOULOS: Let's bring this back to the "Roundtable" now. And Cokie let me begin with you. You saw in Pierre’s piece, still 60% support for the death penalty. Yet we’ve seen a series of botched executions. Some moratoriums in some states. COKIE ROBERTS: And many doctors who won't do them. STEPHANOPOULOS: Who will not do them. That's the problem with the injections. Is the death penalty’s days numbered? ROBERTS: I don't think so. And I'm sorry about that. I'm one of those seamless webbed Catholics. And I think that the death penalty implicates us all in the state sponsorship of death. But I think that, the American people still clearly we see 60% still supporting it, despite the fact that innocent people are on death row and innocent people who are not on death row, but who have life sentences are not even paid any attention to. It's only the people on death row who get some lawyers who try to pay attention and get them off. STEPHANOPOULOS: It ends up being quite expensive as well. LAURA INGRAHAM: I think in 2013, there were about 3,000 people on death row. Only, I think, 2% of those are -- were executed. A small number. 39 people. I'm troubled by the fact that there are people that have been exonerated through DNA. That's horrific. And we have to do something about that. The idea that it's cruel and unusual, the court handled it in 1977. That’s not going to change. But I do think these images will have some perhaps political impact in the anti-death penalty crowd. Of which, President Obama is not, by the way. They’re going to seize on this. But my heart is with the victims of abortion and of the death penalty. Because Cokie is right. A culture of life must be respected, but across the board. INGRAHAM: I think we do have a problem in our culture, our broader culture, of being a culture of death to some extent. We saw that with the Gosnell case. Late-term abortions. The heinous things happening in the womb to children. You don't want to equate it but innocence. There could be innocent people probably today on death row. There’s a lot of innocent life. Forget the early term abortion, late-term abortion that I think young people as well are changing their mind about the issue of abortion. ROBERTS: They are. That’s true.